My kids are dumber than Facebook. So I'm sifting my way through the Facebooks this evening, like ya do, when I came across a picture a friend of mine had posted. The photo depicted her toddler-aged daughter, and by toddler I mean, basically, fetus, and the Van Gogh level art project she had just completed. Now, for truthiness sake, I looked closer and was very pleased to see that some of the more intricate aspects of the picture were actually constructed via stickers, but the picture was still, like, straight up fabulous. 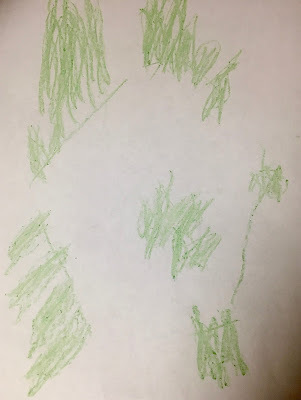 In a world where I can't convince my 4 1/2 year old to utilize a second friggin Crayon to enhance his doodles, this embryonic creature is creating totally comprehensive works of baby art. Would you like to know what this picture is? So would I. It's for Santa. Love, Kaden. Now let's all be honest. We all freakin LOVE to brag about our kids. No mother ever existed who doesn't love to brag about her smarter than yours, cuter than yours, more talented than yours, children. It. Feels. Amazeballs. Of course, there's this whole other side to that equation. And it is called Less Than. It's being the other parent. The parent whose kid struggles to get a C when yours has straight As. The one who cannot score a goal to save his little life. The one who isn't good with peers, when yours is a social butterfly, who can't walk into a room without crashing into the furniture while yours is some kind of ludicrous ballet savant, the one who still struggles to construct a sentence while yours is reciting Hamlet. So yeah, everyone wants to be the mom that can brag about their children's exceptionalism. But there's this other thing for me, wherein I am homeschooling my kids. When people ask how my kids learn stuff, I have to say like, from MY BRAIN. Stuff I know. Stuff I can learn a few hours before I teach them. What if my kids don't look like pre-pubescent Rhodes scholars? Whose fault is it, I ask? MY BRAINS FAULT, OBVIOUSLY. And that is terrifying. I don't like it. They have to be smart so as to prove that I am smart. They have to be talented and attractive and outgoing to prove that... wait now. Just wait. Because I've remembered something for the seventieth time this evening: my kids' lives are not about me. Not me. Not me. Also? Grow up, probably. BRIGHT SIDE: There is a Secret Truth to the internet. And the Secret Truth of the internet is this: All those smart kids? Not that smart. All those good kids? Not that good. Because they can't be. Because they're humans. Because they're small. And because frequent failure is an integral part of growing up. Failing is like, the actual JOB of childhood. So rock on, my crazy bunch of weirdos. Keep trying. Keep failing. Because it makes you better. And because, in the mean time, it's hilarious. Just plain hilarious. Oh, but before I go, here's a list of ways in which MY kids are particularly exceptional. Ways in which you might be jealous of the tiny Einsteins living in my house. 1) Being nice to other kids. Really. They are like, crazy nice. And I think it's superb. 2) Telling jokes that involve their butts. And anything that comes out of their butts. I'm not sure how this skill is going to play into their business school admissions, but... probably it will. I've got hope. 3) Dancing like no one is watching. Around the house. Unceasingly. Also? Singing. Also? Screaming. 4) Reading. Sometimes. On the off chance they feel like it. But during those times? Yeah man. 5) Eating their own boogers. Even when I try to convince them that this is the most disgusting thing ever and they are NEVER GOING TO HAVE ANY FRIENDS IF YOU KEEP DOING THAT. 6) Chewing off their finger and toenails. Zero friends EVER. Same story as above. 7) Conflict resolution. I mean, fewer and fewer arguments are punctuated by one kid punching his or her sibling in the face. I'm rewarding progress here. 8) Operating household electronics. I am old, so this is still fascinating to me. Kids these days know all about that magic computer internet box. Point and Click their way straight into the future. 8) Swimming. Except of course, for my kid who was born with a panic-enducing fear of large or medium sized bodies of water. He is happy to stay on the step. Or on the deck. Or inside the house. Please don't ask him to swim. So in the end, sure. My kids are definitely, and will always be, dumber than Facebook. And so are yours. Let's celebrate those failures, friends. Because it's the failures that keep those weirdos interesting.